Following on from my previous post, regarding an alleged assault, when it was finally discontinued, I was allowed back home and my bail conditions of not being allowed within Conwy’s town walls were lifted. On the 09/01/2010 Anita was driving her jeep through Conwy with my daughter when hawkeyes PC 1627 Chris Jones decides to stop Anita outside the town walls, Anita said ‘what do you want?’ he answered ‘You have got blacked out windows in your jeep & I can’t see who’s in there, I just want to see who’s in the back of the vehicle, as I wouldn’t like Michael to break his bail conditions’ Anita said ‘Well, he’s not in the vehicle and he wouldn’t want to break his bail conditions either’ after taking a look, PC 1627 Chris Jones got in his car and drove off. Readers of the blog, a few posts back a Superintendent says ‘it is not harassment unless the same officer has stopped you on more than one occasion’, if you read in another post I’ve published PC 1627 Chris Jones gave me a breathaliser test as he said he could smell alcohol on Anita’s breath, so this isn’t harassment? 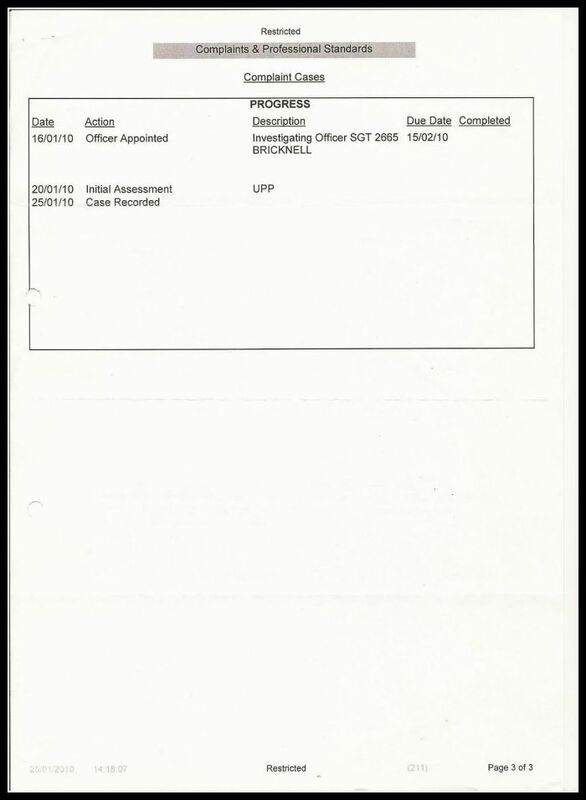 I have been on police 47/3 bail for various alleged offences and on licence altogether for over 10 years, I have never breached any of the bail conditions imposed upon me, the point I’m trying to make to The Mob and to PC 1627 Jones, is why would I want to break my bail conditions, travelling in the back of a car going through Conwy? You may also remember part of my bail conditions was to report to Tuebrook Police station in Liverpool and surrender my passport, please take into account I was given exactly 4 hours to go home, get my clothes and passport etc and then get to Liverpool to report to Tuebrook police station. When I surrendered my passport, the officer at Tuebrook noted it was out of date, in my haste to adhere to the time restriction imposed upon me I had inadvertently picked up my old passport, after explaining this to the officer at Tuebrook he told me not to worry, to contact my wife and get her to drop my current passport off into Conwy Police station, which she did, for them to forward it on. 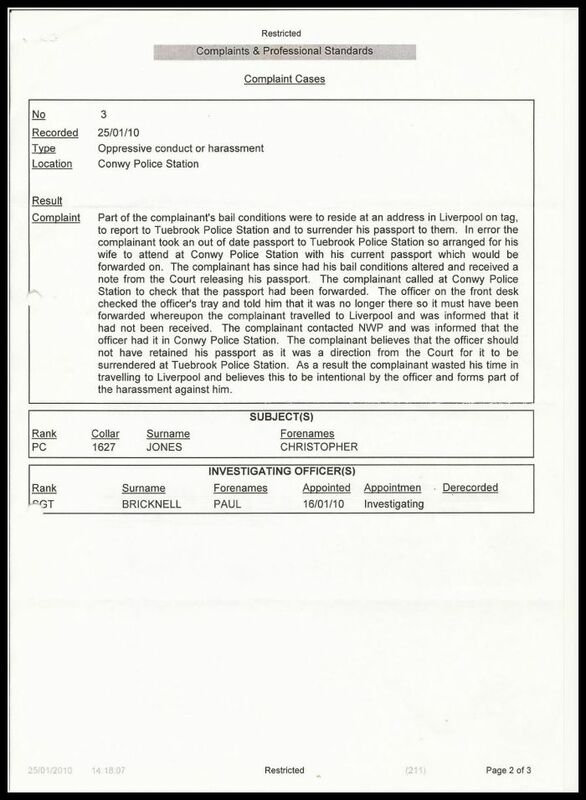 When the bail conditions were lifted I went to Conwy Police station and asked for my passport to be returned, a member of The Mob, said I will go and see if it’s in the tray, where of course it should have been, after some time he came back and told me, that it had been forwarded to Tuebrook police station. So I left Conwy and drove straight to Tuebrook police station to retrieve my passport, after explaining to the officer at Tuebrook why I was there, he went and checked but said there was no passport here. He then phoned Conwy police station on my behalf and spoke to the officer, who then said they had my passport there, these are the childish little games The Mob play. I returned to Conwy police station and retrieved my passport. 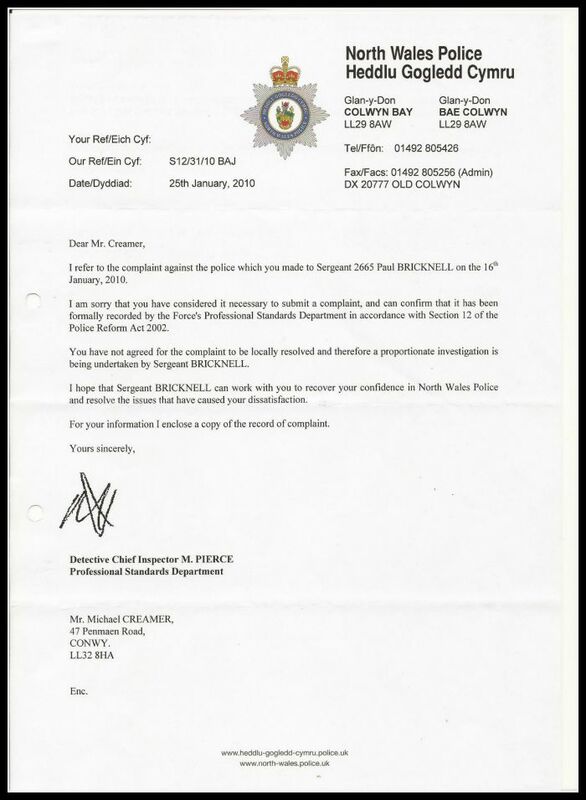 I made a complaint about this incident to Sgt 2665 Paul Bricknell, who in turn forwarded it on to Detective Chief Inspector M Pierce who was head of Professional Standards. On the 30th January 2010, I was driving from Llandudno Junction in my car, as I was coming over the cob, I noticed there was a police vehicle right behind me, the officers were PC 1929 Logan and PC 2538 Rob Jones, they followed me through Conwy, I pulled up by the Archway chippy, they came over to my vehicle, I asked them ‘What do you want?’ they said ‘we are checking your bail conditions, you shouldn’t be in Conwy’, I replied ‘you have just followed me across the cob, do you think I would drive through Conwy if I wasn’t allowed?’, they went ahead and did their checks and I heard it come over their radio that I had no bail restrictions, you could see the disappointment in their faces. I walked away to get in my vehicle, they said ‘wait there, we are going to do some checks, to make sure you have valid MOT & insurance for this vehicle’, they did their checks, which all came back valid and up to date, their disappointment stood out a mile again, they even had the cheek to say ‘you’re parked on double yellow lines’ to which I replied, ‘you just stopped me you idiot, where do you want me to stop, in the middle of the road?’ I looked at them and said ‘you need to get a life’, I then got back in my vehicle and drove off. You will read more about PC 2538 Rob Jones later on this blog, Rob Jones did say prior to my leaving the scene ‘you need to get a letter of confirmation from the courts to say your bail conditions have been discontinued in case you are stopped again’. On the 1st February 2010, I went to Llandudno Magistrate court to get a slip of paper to say the case had been discontinued, please see below. I did go on to make a complaint regarding Logan & Jones to Professional Standards, but once again it’s the police investigating the police, they won’t do anything.